to my playtime in the garden. but, a first time visitor to Clay and Limestone. to find out about this beauty! It prefers a sunny area with bare ground and low vegetation...Which explain how happy he was to be flying around my grassy area in the front garden...It's all clover, native sedges, left over turf grasses, and a few of its favorite plantain, poking up here and there. Larval host foods include plants from the snapdragon family (toadflax) and ruellias. It also takes up nutrition from mud and dirt. 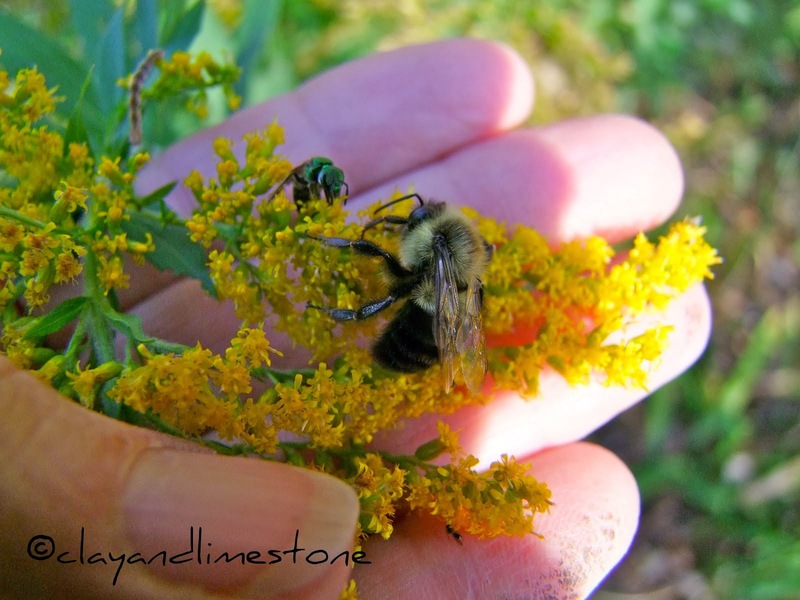 It's favorite nectar sources are composites including aster, chickory, gumweed, knapweed, and tickseed sunflower. Dogbane, peppermint, and other flowers are also visited. It's a perching and flying around to attract females kind of critter. slowly open and close his beautiful wings. return to very nearly the same spot! They are so pretty! Those spots look just like eyes too. How lucky to have one come to your garden. I've never seen one here, perhaps they don't come this far north. What a beautiful design on his wings. Isn't nature amazing? You made my day. Unfortunately I need to live vicariously through other bloggers when it comes to butterflies this year. I never ran into a single one this year. One day when we get our farm, we will do everything we can to remedy that. There probably still are many out in our area, I just wasn't looking hard enough. Our city is not using pesticides, but it still is a city, it might take a few years for the balance to change. What great shots you got. jen, We haven't had as many butterflies as usual...the cooler weather hasn't helped them...although, it made for a pleasant summer. Cindee, Tootsies is a landmark Nashville bar. When the Grand Old Opry was located downtown the performers would pop over to Tootsies to play a few sets and grab a drink. It's a big tourist destination and kind of dicey! Marnie, They are in your part of the world~~plant a few plantains and see if they show up! Tina, Their eye spots are to scare small birds away! It's a really pretty butterfly. gail, great images, My own lack of prowess with butterfly pix is legendary. Well done. I think the buckeyes are so pretty! I had one on the verbena bonariensis this year. Wow! That is something to make anyone's day! The spots look just like eyes. I like that Maya Angelou poem you shared. Where does everyone find all these fabulous poems? Makes since now....I grow snapdragons and ruellias..and have quite a few Buckeyes...aren't they special? That first picture is just a stunner. Buckeyes are beautiful butterflies. I didn't see as many here as last year, maybe because there was less toadflax. Plenty of Ruellia though! What a beauty he is, and what a fabulous capture of him. It was the most beautiful of days yesterday, there will be more blue October skies. I love buckeye butterflies. They are very prolific around here. I always feel blessed to have one in the garden. You have some great photos here. Beautiful photos of the Buckeye Butterfly. I enjoyed the Maya Angelou quote too. What a beautiful photo! In Sweden we have a similar called "peacock eye"
Missed your Tootsie's sign - what a blast from the past - I'm probably the only person who asked for a glass for their beer. Had a great band that afternoon. The wonderful buckeye butterfly - what great colour & very interesting pattern of eyes across the wings - do you know if it is pretending to be something else so it won't be eaten? oh, I love these! There are a lot of them around here! You're right they are so flirtatious. A lovely visitor! Your photos are great. What a lovely find! Thank you for sharing the information about it. A true beauty, Gail. We saw so few butterflies this year that each one we did see was ohhed and awed over. We do have the buckeye here most years and they are delightful. So glad you had such a special visitor to your garden. How lucky you were to see him! But he must have heard that your garden has everything he likes:) I did see at least one Buckeye here last year, but this year we were lucky to see any butterflies at all. I did see my little hummingbird here yesterday--amazingly. I do hope he got the news to fly south before it freezes here this weekend. Gail, I just checked out the website, "Encounters with Remarkable Biscuits." Loved your story! I've always loved English mysteries, and for years I wondered why the English were always eating biscuits:) Of course, that wasn't quite as strange as "beans on toast." Lucky you! 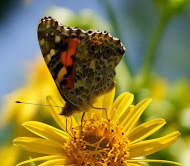 I hadn't seen a butterfly in weeks, then on Wednesday, there was a Painted Lady on the Asters. I grabbed the camera - and scared it away. What a beauty! How much time do you have before you get a frost? I don't remember what your coldest temps are. I am sad we've had our early freeze this year. That butterfly sure is a beauty! Buckeye Butterflies are my absolute favorite - just seeing your photo transports me back in time to when I was a little girl chasing them. Thanks for the beautiful post, and for the incredible photographs!